Snow, rain and wind are set to continue to batter the United Kingdom this weekend as Storm Erik rages on through Saturday. One lane is closed on the Severn Bridge between South Wales and south west England due to the strong winds, and the A548 is closed in both directions around Mostyn, north Wales, because a tree had fallen across the carriageway. 'Sunny spells for many of us, also a mixture of rain and showers in other parts of the UK. Not many showers are expected from mid-morning onwards, with a chance of a bright if blustery afternoon across the Midlands and Eastern England. As this morning progresses, however, the rain and cloud cover will head towards Scandinavia although, for most areas in the south, it will still be a wet start to the day. 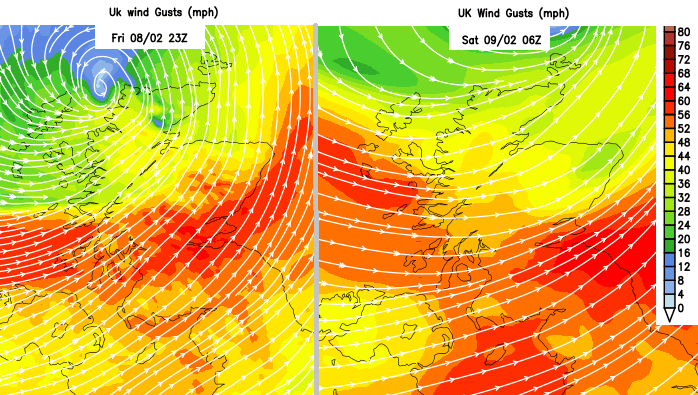 Forecasters issued two weather warnings for Friday for strong winds across Northern Ireland and western Scotland until the evening, and for heavy rain in Scotland until Saturday afternoon. "Because of the cold air, this could fall as snow on higher ground in Scotland and England on Sunday".